Solar photovoltaic system or Solar power system is one of renewable energy system which uses PV modules to convert sunlight into electricity. The electricity generated can be stored or used directly, fed back into grid line or combined with one or more other electricity generators or more renewable energy source. Solar PV system is very reliable and clean source of electricity that can suit a wide range of applications such as residence, industry, agriculture, livestock, etc. Major system components Solar PV system includes different components that should be selected according to your system type, site location and applications. The major components for solar PV system are solar charge controller, inverter, battery bank, auxiliary energy sources and loads (appliances). 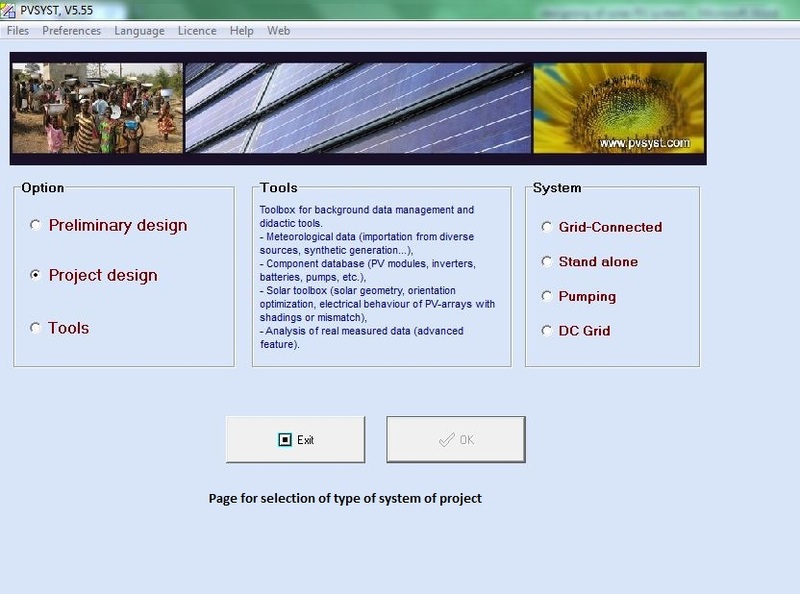 PV Modules: Converts sunlight into DC electricity. Solar Charge Controller: Regulates the voltage and current coming from the PV panels going to battery and prevents battery overcharging and prolongs the battery life. Inverter: Converts DC output of PV panels or wind turbine into a clean AC current for AC appliances or fed back into grid line. Battery: Stores energy for supplying to electrical appliances when there is a demand. Example: A house has one 18 Watt fluorescent lamp with electronic ballast used 4 hours per day,one 60 Watt fan used for 4 hours per day and one 75 Watt refrigerator that runs 24 hours per day with compressor run 12 hours and off 12 hours.The system will be powered by 12 Vdc, 100 Wp PV modules. 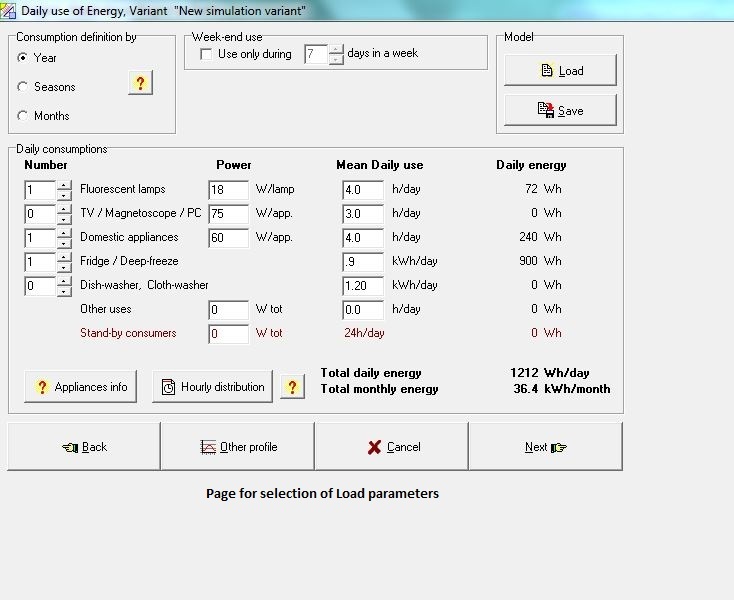 Result of the calculation is the minimum number of PV panels. If more PV modules are installed, the system will perform better and battery life will be improved. 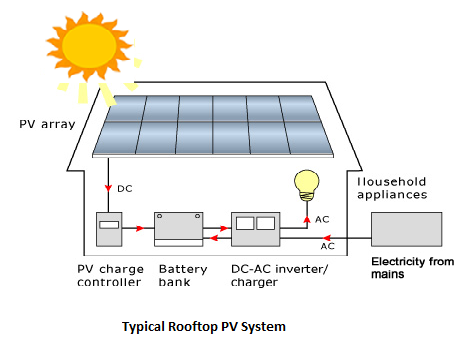 If fewer PV modules are used, the system may not work at all during cloudy periods and battery life will be shortened. Battery Capacity (Ah) = (Total Watt-hours per day used by appliances x Days of autonomy)/(0.85 x 0.6 x nominal battery voltage) i.e. (1212*3)/(0.85*0.6*12) = 594.11 Ah.So the battery should be rated as 12V, 600Ah, 3 days autonomy. 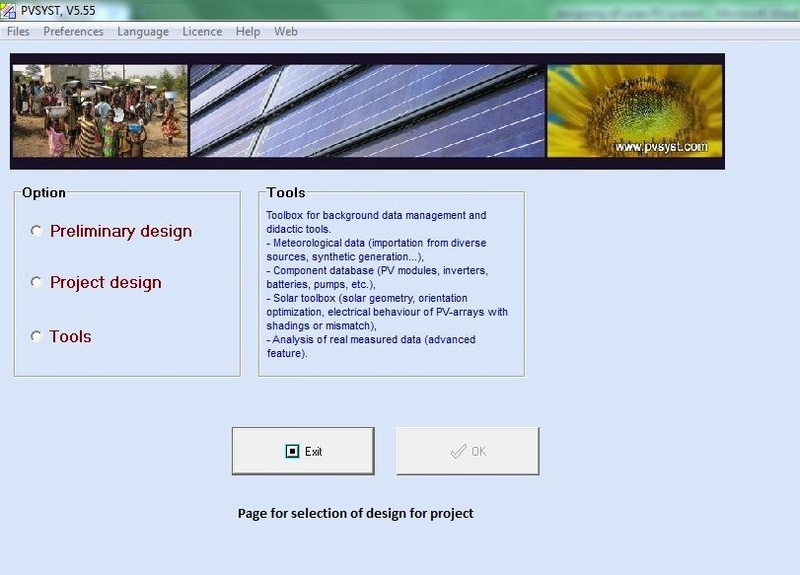 In the above there are 3 options to choose and in that preliminary design is used when full data is not available with us and project design is used when data is available and tools for extracting data from software. This is the page where we will select required data and we can enter data which we have to input. First we should click on project. It will open another page and in that first we should select New Project option.Now we should select where we are going to install the system. 3.Then it will ask for selecting site and meteo where we want to install the stand alone system.So we should select site and meteo then it will open another page as below.Here I selected for India, Delhi site. 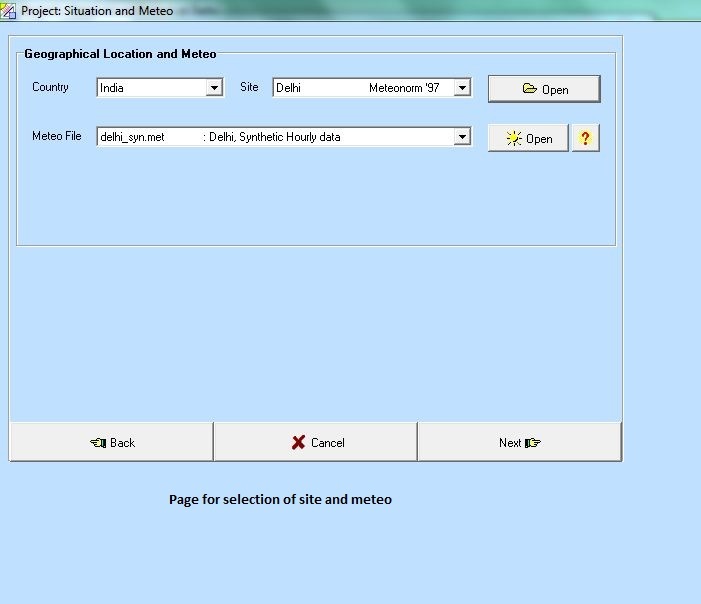 Here we can select country, site area and meteo file and then click next. It will open another page and in that page we should click on OK, then will open another page where it will ask for save option and we should click on save.Then it will open previous page and there we should click on back and it will open the home page for project parameters. [/ezcol_1half] [ezcol_1half_end]4.Now click on orientation it will ask for how much tilt we want to keep, It should be nearly equal to latitude angle of the site. Delhi latitude angle is 30 degrees that’s why I kept 30 degrees.And then click on OK then it will open again home page for project parameters. In the above page we can select the daily consumption like I have selected 1 flouroscent lamp of 18 watts which will run for 4 hours per day and 1 fan(domestic appliance) of 60 watts which will run for 4 hours per day and fridge which consumes .9kwh/day. And then click on Next. 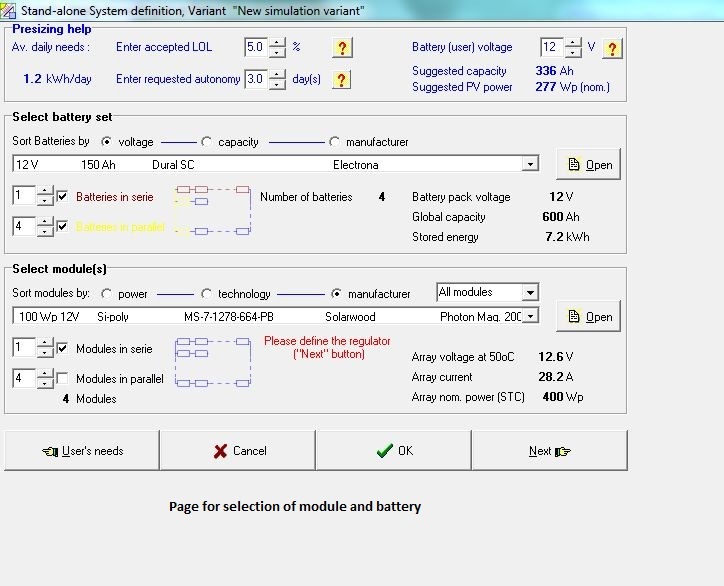 In the above page we can select the battery as per requirement and as our requirement is 600Ah I selected 150 Ah of 12 volts batteries of 4 which are connected in parallel. Modules are also selected which are four 100Wp of 12 volts are selected which are connected in parallel. And then click next then it will open another page and click on default regulator and click on OK. 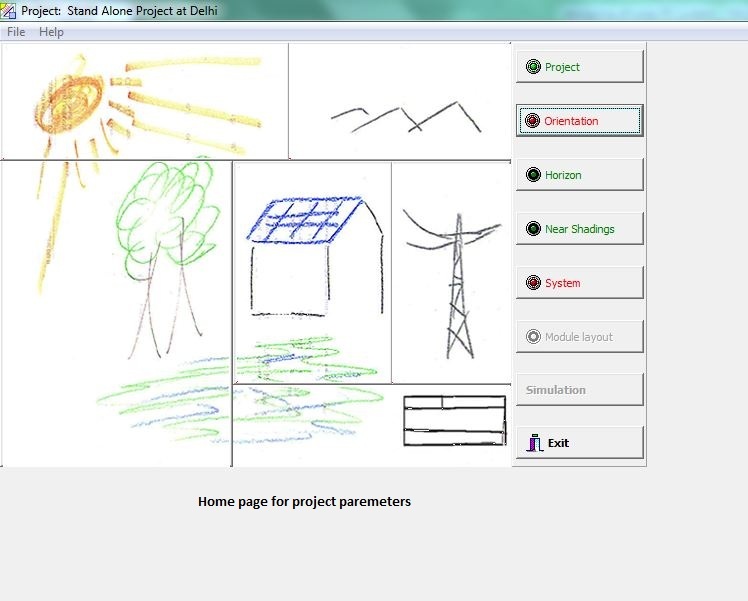 In this page we can also click what ever tracking system we want and then we should click on OK and it will open again home page for project parameters. 7.Now click on simulation it will open another page and there also click on simulation again then it will be simulated and opens another page where we should click on OK. Then it will show the results page as below. In the above page we can get the production in whole year as 613kWh/year i.e. 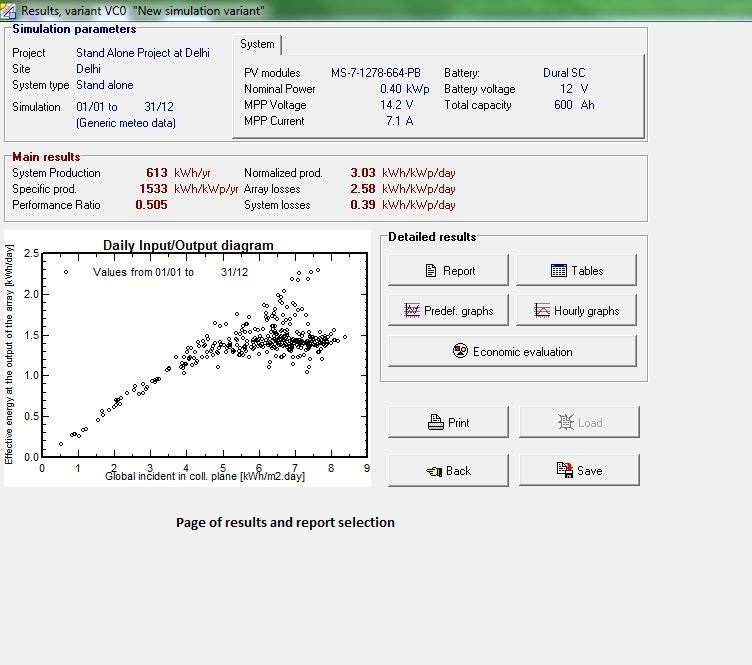 on an average 1.68kwh/day where as our normal requirement when calculate manually we got 1.6kWh/day is equal.So our data analysis is approximately equal to the software report. How you are assuring zero leakage of rain water by using only the solar panels without using roofing sheets. Give detail sketch of panel dimensions. Thank you sharing the knowledge it is very good of you that you have given a detailed knowledge of setting up rooftop solar panels. Also I like the software analysis system as it is really a nice thing. We should all go rooftop solar systems to produce electricity which is pollution free rather than using coal.